Gentoo Linux (/ˈdʒɛntuː/ jen-too) is a computer operating system built on top of the Linux kernel and based on the Portage package management system. It is distributed as free and open source software. Unlike a conventional software distribution, the user compiles the source code locally according to their chosen configuration. There are normally no precompiled binaries for software, continuing the tradition of the ports collection, although for convenience, some software packages (such as Mozilla Firefox and LibreOffice) are also available as precompiled binaries for various architectures where compiling would otherwise be very time consuming. The development project and its products are named after the fastest-swimming penguin, the Gentoo, to reflect the potential speed improvements of machine-specific optimization. Gentoo package management is designed to be modular, portable, easy to maintain, flexible, and optimized for the user's machine. Gentoo describes itself as a meta-distribution, "because of its near-unlimited adaptability", in that the majority of users have configurations and sets of installed programs which are unique to themselves. Gentoo Linux was initially created by Daniel Robbins as the Enoch Linux distribution. The goal was to create a distribution without precompiled binaries that was tuned to the hardware and only included required programs. At least one version of Enoch was distributed: version 0.75, in December 1999. Compilation issues revealed problems with the GNU Compiler Collection (GCC), used to build from source code. Daniel Robbins and the other contributors experimented with a fork of GCC known as EGCS developed by Cygnus Solutions. At this point, Enoch changed name to Gentoo Linux (the Gentoo species is the fastest swimming penguin). The modifications to EGCS eventually became part of the official GCC (version 2.95), and other Linux distributions experienced similar speed increases. After problems with a bug on his own system, Robbins halted Gentoo Linux development and switched to FreeBSD for several months, later saying "I decided to add several FreeBSD features to make our autobuild system (now called Portage) a true next-generation ports system." Gentoo Linux 1.0 was released March 31, 2002. In 2004, Robbins set up the non-profit Gentoo Foundation, transferred all copyrights and trademarks to it, and stepped down as Chief Architect of the project. The current Board of Trustees is composed of five members who were announced (following an election) on March 2, 2008. There is also a seven-member Gentoo Council that oversees the technical issues and policies of Gentoo. The Gentoo Council members are elected for a period of one year, each year by the active Gentoo developers. When a member of the Council retires, the successor is voted into place by the existing Council members. The Gentoo Foundation is a 501(c)(6) non-profit foundation, registered in the State of New Mexico. In late 2007, the Foundation's charter was revoked, but by May 2008 the State of New Mexico declared that the Gentoo Foundation, Inc. had returned to good standing and was free to do business. 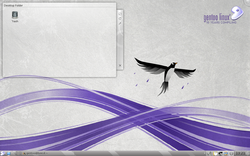 Although originally built on the x86 architecture, Gentoo has been ported to many others. Currently it is officially supported and considered stable on x86, x86-64, IA-64, PA-RISC, PowerPC, PowerPC 970, SPARC 64-bit and DEC Alpha architectures. It is also officially supported but considered in development state on MIPS, PS3 Cell Processor, System Z/s390, ARM, and SuperH. Official support for 32-bit SPARC hardware has been dropped. Portability toward other operating systems, such as BSD-derived ones including Mac OS X, is under active development by the Gentoo/Alt project. The Gentoo/FreeBSD project already has a working guide based on FreeSBIE, while Gentoo/NetBSD, Gentoo/OpenBSD and Gentoo/DragonFly are being developed. There is also a project to get Portage working on OpenSolaris. There was an unofficial project to create a Gentoo port to GNU Hurd but it has been inactive since 2006. Portage is Gentoo's package management system. It is similar in idea to the BSD ports collections: the original design was based on FreeBSD ports. In contrast, the Portage tree does not contain directories of Makefiles, but of so-called ebuilds, bash scripts that describe separate functions to download, configure, make, install and remove a package and additional functions that can be used to set up the operating environment for a package. Portage's main utility is emerge, which is written in Python and can be used by privileged users to inspect and alter the set of installed packages on a Gentoo operating system. Whereas emerge used to operate in a similar way to other ports collections, by entering a directory in the tree and using emerge (instead of make) to perform package management operations, it now reads variables from the file /etc/make.conf (again similar to ports) to determine where the Portage tree is kept. Alternative package management utilities like Paludis and pkgcore have seen heavy development. Both are intended to be used alongside or instead of the official Portage utilities in both development and practical use. As both competing projects intend to replace the official utilities, an effort has been raised to standardise the application programming interface (API) of ebuilds for all package managers, in a project called the Package Manager Specification or PMS. Gentoo's init system is another important feature. It is similar to the System V init system that most Linux distributions use, but uses dependency-based scripts and named run levels rather than numbered ones. It also includes a command called rc-update which manages runlevels. Gentoo startup scripts use the runscript shell interpreter, rather than a more traditional shell. Originally Gentoo's rc system was written entirely in bash and was part of the baselayout package, which contains the basic filesystem layout and critical files needed for the system. However, this led to several limitations. For example, certain system calls needed to be accessed during boot which required C-based callouts to be added. These callouts were each statically linked, causing the rc system to bloat over time. Additionally, as Gentoo expanded to other platforms such as Gentoo/FreeBSD and Gentoo Embedded, requiring the relatively heavy bash shell for the rc system became undesirable or sometimes impossible. This led to a development of baselayout 2, which was written in C and only required a POSIX-compliant shell. During this development, it was decided that it was a better fit if baselayout provided only the base files and filesystem layout for Gentoo, and the rc system was broken off into an independent project – OpenRC. Gentoo may be installed in several ways. The most common way is to use the Gentoo minimal CD with a stage 3 tarball (see below for more explanation on stages). As with many Linux distributions, Gentoo may be installed from almost any Linux environment, such as another Linux distributions' LiveCD, LiveUSB or Network Booting using the Gentoo Alternate Install Guide. A normal install requires a connection to the internet, but there is also a guide for a network-less install. Previously, Gentoo supported installation from stage 1 and 2 tarballs. However, this no longer recommended officially by the Gentoo foundation, and is meant only for Gentoo developers. Following the initial install steps, the Gentoo Linux install process requires that all users compile their own Linux kernel. This process is generally not required by more simplified Linux distributions. Although this is widely regarded as a complex task, Gentoo provides documentation and tools such as Genkernel to simplify the process and make it straightforward for novice users. Support for installation is provided on the Gentoo forum and on irc. Starting with version 2004.0, Gentoo introduced a tool called Catalyst, which is used to build all Gentoo releases and can be used to build one's own customized install media. In the summer of 2008, Gentoo's founder Daniel Robbins released a new build tool called metro. Metro is used to build releases of funtoo, a slight variant of Gentoo Linux, which is developed and maintained by Daniel Robbins. However, Metro has not yet been integrated into the Gentoo release process. Stage1: System must be bootstrapped and the base system must be compiled. Stage2: System has already been bootstrapped, but the base system must be compiled. Stage3: System has already been bootstrapped and the base system already compiled. As of November 2005, only stage3 installations are officially supported. Tarballs for stage1 and stage2 were distributed for some time after this, although the instructions for installing from these stages had been removed from the handbook and moved into the Gentoo FAQ. Only the supported stage3 tarballs are currently available. A Live USB of Gentoo Linux can be created manually or with UNetbootin. A graphical installer (the Gentoo Linux Installer project, or GLI) was released with 2006.0, but the project did not gain enough development support and is no longer supported as of 2008.0. From 2003 until 2008, the Gentoo Reference Platform (GRP) was a snapshot of prebuilt packages that users could quickly install during the Gentoo installation process, to give faster access to fully functional Gentoo installation. These packages included KDE, X Window System, OpenOffice, GNOME, and Mozilla. Once the installation was complete, the packages installed as part of the GRP were intended to be replaced by the user with the same or newer versions built though portage which would be built using the users' system configuration rather than the generic builds provided by the GRP. As of 2011, the GRP is discontinued, the final reference to it appearing in the 2008.0 handbook. Once Gentoo is installed, it becomes effectively "versionless"; that is, once an emerge update is done, the system is at the latest version, with the most up-to-date packages available (subject to restrictions that a user may have specified in their Portage configuration files). For example, if a system is installed using a stage3 from March 2011, and the user performs a full emerge update one month later, they will upgrade the installed Gentoo system to the same as they would have if they had performed a fresh installation from an April 2011 CD. Thus, Gentoo users may upgrade to the latest version of all of their installed software the day that new versions are released and have an ebuild available. Like other linux distributions, Gentoo systems have an /etc/gentoo-release file, but this contains the version of the installed sys-apps/baselayout package. In 2004, Gentoo began to version its Live media by year rather than numerically. This continued until 2008, when it was announced that the 2008.1 LiveCD release had been cancelled in favour of weekly automated builds of both Stages 3 and Minimal CDs. On 20 December 2008, the first weekly builds were published. In 2009, a special LiveDVD was created to celebrate the Gentoo 10-year anniversary. In 2009, a special LiveDVD was released to celebrate Gentoo's 10-year anniversary. Initially planned as a once-off, the LiveDVD was updated to the latest package versions in 2011 due to its popularity among new users. Compiling packages from source takes considerably more time than installing pre-built binaries. In some cases (depending on the size of the source code to be compiled and hardware) compilation of large programs can take hours and may also require a few gigabytes of temporary disk space in which to build. Generally, Gentoo users accept long compile times as the cost of being able to apply their own compile-time options and enjoy the flexibility of portage, but Gentoo developers have created a number of work-arounds to avoid slow package installation. Pre-compiled binaries are provided for some applications with long build times, such as OpenOffice.org and Mozilla Firefox, provided by upstream maintainers. By using these binaries, installation time is equivalent to other linux distributions, but users lose the ability to customize optional features. The standard installation process gives users configuration options to reduce compilation times, such as enabling parallel compilation and using pipes instead of temporary files. Other optional features of the Portage system include distributed compiling and using a compiler cache. In addition, the user may be able to mount a large filesystem in RAM to greatly speed up the process of building packages. Some of these approaches have drawbacks, and so are not enabled by default. When installing the same package on multiple computers, the package may be compiled once and a binary package created for quick installation on the other computers, assuming sufficiently similar hardware. A Gentoo Penguin is the fastest-swimming of the penguin family. The name evokes an image of speed, while retaining the penguin as a generic mascot for Linux. The official Gentoo logo is a stylized 'g' resembling a silver magatama. Unofficial mascots include Larry The Cow and Znurt the Flying Saucer.